Filed Under: News by J Bennett — Comments Off on Shatner’s World Ticket Giveaway This Week on Niteshift! 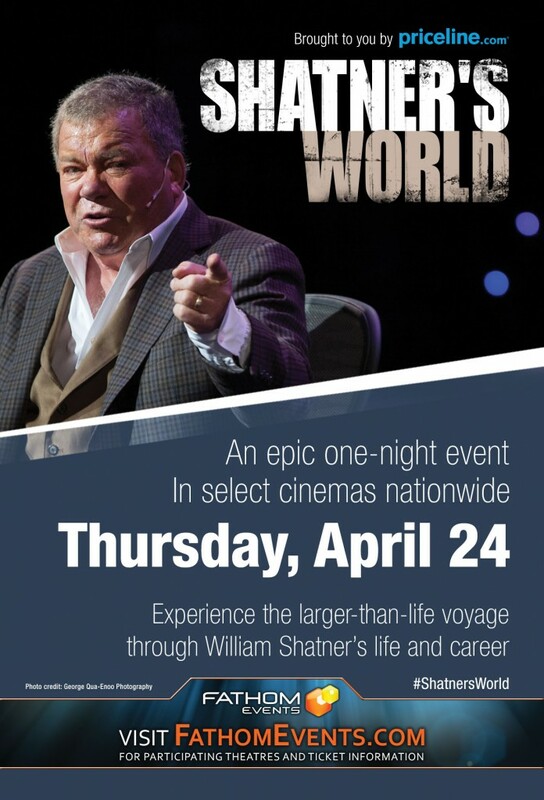 Niteshift will be giving away 4 pairs of tickets for the screening of SHATNER’S WORLD on Thursday, April 24 & a $150 Priceline promo code valid at any of their hotels. SHATNER’S WORLD is playing at the following New York City movie theaters on April 24 only: AMC Empire 25, AMC Loews Kips Bay, Regal Union Square, College Point Multiplex (Flushing). Don’t miss your only chance to see this larger-than-life entertainer on the big screen. Tune in to WBAI 99.5 FM this Monday night for your chance to see SHATNER’S WORLD, courtesy of Fathom Events & Priceline.com. Shatner’s World, the critically acclaimed one-man show, takes audiences on an exhilarating behind-the-scenes voyage through his storied life and career. With an energetic mix of personal anecdotes, laugh-out-loud humor and poignant moments, William Shatner shares his phenomenal journey from classically-trained Shakespearean actor to internationally-known cultural icon, all the while illuminating the unique persona of his most important character, himself. Tickets for SHATNER’S WORLD are on-sale now at www.FathomEvents.com!